The month of love is here and it’s shining brightly with this month’s daily download. I can’t wait to see layouts created with it. Before I show it off, though, I have to share January’s Daily Download! 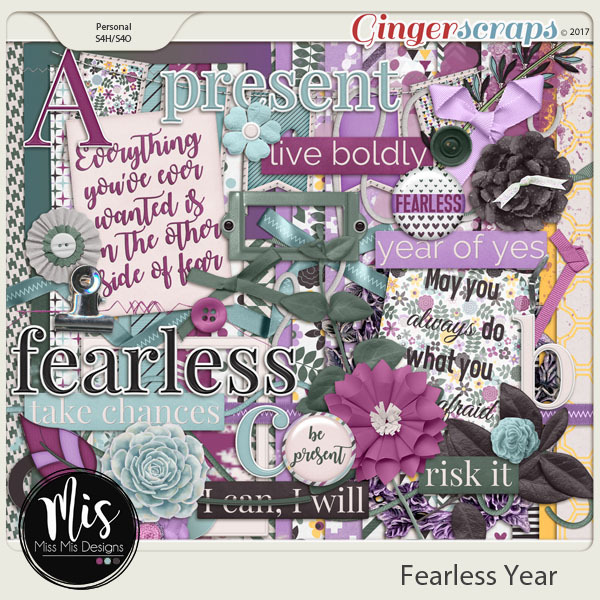 It was all about facing the year without fear and making it your year! NOTE: So glad you enjoyed the January kit! Also thank you for pointing out that the item mmd_fy_smudge1.png needed some improvement. Misty (MissMis Designs) got that item fixed and here is a link. And here’s the love-filled download for February! What a beautiful kit — the pinks & purples are my GDs favorite colors!!! thank you very very much to Miss Mis for sharing with us her wonderful kit! and thank to Neverland for hers. It’s seems to be amazing!